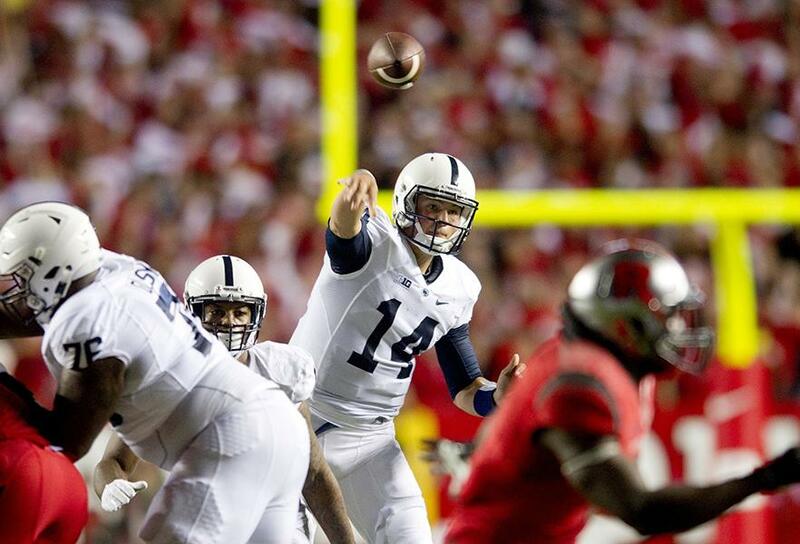 Penn State’s Christian Hackenberg throws a pass against Rutgers on Sept. 13. Northwestern’s defense will have its hands full with the multi-talented quarterback Saturday. Listed at 6 feet 4 inches and 234 pounds, Penn State’s Christian Hackenberg is the kind of quarterback prospective that coaches dream of having. But Northwestern coach Pat Fitzgerald and the Wildcats’ defense may find Hackenberg to be the stuff of nightmares instead. Fitz paints the picture of a player who is hard to scheme against and even harder to make plays on come game day. Hackenberg isn’t unstoppable, but he certainly has been a headache for opposing defenses thus far. Some of his traditional stats don’t look stellar, like the pedestrian 60.7 percent completion rate or the four-to-five touchdown-to-interception ratio, but fixating on these limited figures belies his tremendous ability. Hackenberg is throwing for a healthy 8.4 yards per attempt, which ranks ninth among all NCAA Football Bowl Subdivision quarterbacks with at least 100 passing attempts. His efforts have helped make the Nittany Lions the 10th-ranked passing offense in the country, sandwiched between juggernauts like Oregon and Baylor. Penn State by all accounts is a team that has underachieved this season, but in spite of that they enter Saturday with an undefeated record, and the presence of Hackenberg has them poised to make a run through a weak Big Ten. It remains to be seen if NU is up to the challenge of halting that advance. NU’s maligned secondary surrendered 300 passing yards to Cal and its second-year quarterback Jared Goff in the season opener. While notorious as an offense that simply piles up yardage as a result of volume and not efficiency, the Golden Bears actually mustered a respectable 7.69 yards per attempt. There was a respite against run-heavy Northern Illinois before the back four was gashed for 292 yards against much less notable Western Illinois. Junior cornerback Nick VanHoose drew praise for his play in that game, but again that’s likely a result of volume rather than efficiency. The best defensive backs don’t even have the ball thrown their way; VanHoose made some good looking plays but any corner will if the ball is thrown his way often enough. Across from him, sophomore cornerback Matthew Harris has shown few signs of progress from last season. Repeatedly picked on by opposing quarterbacks through the first quarter of the season, Harris has been a liability in coverage. Even when he makes a good play, it’s often the result of him using his athleticism to recover for a mental or schematic mistake. Safeties senior Ibraheim Campbell and junior Traveon Henry are above-average Big Ten starters, but their job is to be the last line of defense, not the first. If relief is to come, it needs to come from the defensive line. The Cats’ salvation against Western Illinois was the breakout play of defensive end and pass-rush specialist Ifeadi Odenigbo, but it remains to be seen if the diminutive sophomore can produce the same results against a more talented Penn State offensive line and the mobile Hackenberg. What’s telling is that of NU’s eight sacks this season, only 1.5 have come from players that aren’t defensive lineman. In other words, the defense isn’t blitzing. A team doesn’t have to rush extra defenders to be successful, but generating pressure on the opposing quarterback is the best remedy for a leaky secondary. The best way to contain Hackenberg is to keep him on his back, a result that would require some aggressive scheming by the defense. Going up against a quarterback as skilled as Hackenberg, taking care likely will not be enough.